The first record of a church in Sutton Veny (or Great Sutton) occurs in 1240 which was dedicated to St Leonard, and this served the parish until the end of the 19th century. The rector in 1700 was Richard Bayly who sadly lost his wife and his 3 children in unconnected events before he died in 1716. On census day in 1851 there were 130 people in the church for morning service and 240 for the evening service. As a result of the disrepair of St Leonard's Church due to subsidence, another church was urgently needed in the parish. John Everett was a local clothier and landowner and when he died in 1865 his widow and family decided to fund the new parish church of St John the Evangelist. It is a very impressive church built in Early Decorated style of Frome stone with Box ground stone dress. In 1863 the average congregation was said to be 250. Despite a major restoration in 1831, the low lying damp ground caused the foundations to be extremely unstable, and it was decided in 1866 that St Leonard's Church should be abandoned for a new church built on higher ground 700 yards further to the north west (the present day St Johns the Evangelist). 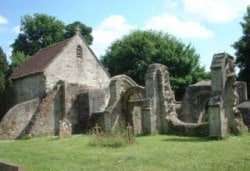 Today St Leonard's Church with the exception of the chancel has fallen into ruins. The chancel has been well maintained and there is a sign on the door giving the address of the key holder. The arches of the crossing and lancet windows on the north wall of the chancel date from the 13th century. Pictures from inside the Church are here and it is well worth a visit ! 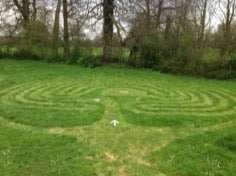 A mown labyrinth/reflective path has now been established in the churchyard extension, adjacent to the Alexander Field. Despite its compact size it contains about 150 yds of path and it takes about 2-3 minutes to get to the centre. Do come and experience it! It was designed by one of the most stylish of the Victorian architects - John Loughborough Pearson.The altar was presented by the Bishop of Salisbury and there is a large carved oak lectern of considerable quality. The six bells were brought from the old church of St Leonard and in 1927 were rehung in a metal frame. Three of the bells (numbers 1, 2 and 3) date from the 17th century and the remainder from the 18th century. (No 5 was cast Robert and James Wells, and No 6 by William Cockey of Warminster). In 1918 a number of servicemen, many of then Australians, who died in the influenza epidemic of that year were buried in the graveyard alongside those who died from wounds. Five Australian nurses are buried there and up until 1963, 39 German prisoners were also buried in the graveyard but were transferred in that year to a German prisoner of war cemetery in Staffordshire. Regular services are held today by the Upper Wylye Parish Team. There is a yearly memorial service on the Sunday closest to Anzac Day on 25 April. The Baptist Chapel at Crockerton Green founded in 1669 is believed to be the first of the non conformist place of worship in the local area. Thomas Gibbons preached to the New Meeting group in the late 18th century in Sutton Veny and in 1793 the Congregational Chapel in Sutton Veny was built (opposite to Dymocks lane/Walnut Close today). This building met with some opposition in the village and one farmer threatened to pull down the walls as they were being erected. A school room and a burial ground was added in 1818. In 1800, average attendance at this chapel on a Sunday was 116 in the mornings, 151 in the afternoons and 300 in the evenings. This reduced over the years until in 1962, the membership was 8. The chapel was demolished in 1970 but the Chapel School which adjoined the Chapel is now a house called Little Hall. The school closed before the First World War. It was used as a NAAFI in the Second World War and as a meeting and function room for the village until all chapel property was sold. 1812 William D. Thring D.D. 1896 Arthur J. Everett M.A. 1923 Eustace A. Chorley M.A. 1946 Howard M. Bennett M.A. 1963 Edward Wade-Stubbs Lth, B.A. 1967 Roland C. Desch M.B.E. A.K.C.